Monday, November 26 – Students will be able to identify all of the important parts of a circle using the appropriate vocabulary. Tuesday, November 27 – Students will be able to determine the measure of a central angle given information about the intercepted arc or the measure of the arc given information about the central angle. Wednesday, November 28 – Students will be able to determine the measure of an inscribed angle or its intercepted arc. Teacher notes/demonstration on Inscribed angles and their arcs. Thursday, November 29 – Students will be able to Determine the measure of angles or arcs created when chords intersect in a circle. Teacher notes/demonstration of problems involving chords in circles. Students to practice problems with chords in circles. Friday, November 30 – Students will be able to determine measures of arcs and angles created when the vertex of the angle falls outside of the circle. mini-Quiz on vocabulary, central angles, inscribed angles, and angles formed by chords. Teacher notes/demonstration of angles whose vertex falls outside of the circle. Practice problems involving angles whose vertex falls outside of the circle. 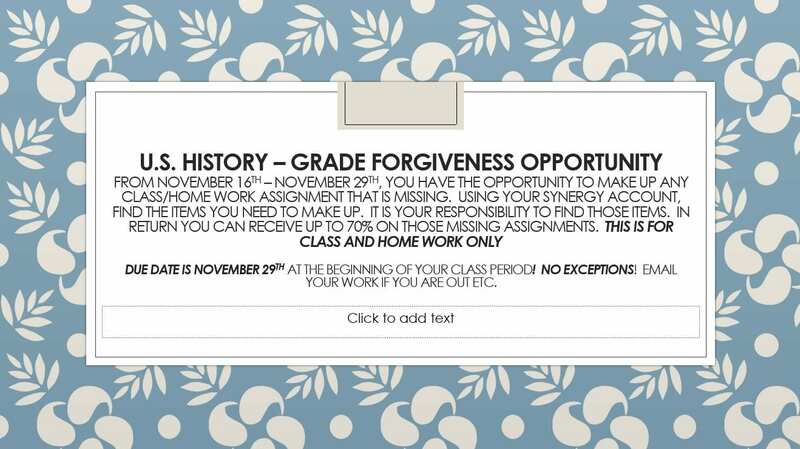 Nov. 26: Grade Forgiveness DUE!!! Monday, November 12 – Students will be able to complete basic constructions in geometry. Mrs. Johnson will work with small teams who feel they need visual instruction. Students can also choose to work at their own pace. A circles theorems practice packet will be distributed. Students who either finish constructions early or are waiting for hands on instruction should work on the practice problems as any problems not completed in class will be assigned for homework. Tuesday, November 13 – Students will be able to construct an inscribed equilateral triangle, an inscribed square, and an inscribed hexagon. Students will also be able to construct a line that is tangent to a circle. Students will be split into groups and will rotate through 5 stations in the classroom. 4 construction stations and 1 practice work station. Wednesday, November 14 – Students will be able to find the circumcenter and incenter of a triangle. Students will be given a triangle and will construct perpendicular bisectors and angle bisectors to find the circumcenter and the Incenter. Once the constructions are complete, they will be given a practice packet for circle and angle theorems. The answer keys to the two prior practice from the week will be posted for students to check their work and question their mistake with teachers. Thursday, November 15 – Students will be able to identify areas of strength and weakness in using circle theorems to solve problems. Mrs. Johnson will field questions from the prior three day’s reviews. Students will work review 2 as a practice test. Friday, November 16 – Students will be able to use properties of circles and lines that intersect them to find missing values. Agenda: Students will take the first Circles test. Monday, November 5 – Students will be able to find missing values and lengths of segments using the properties of tangent lines to circles. Wednesday, November 7 – Students will be able to use properties of chords in circles to determine missing values. Friday, November 9 – Students will be able to apply the right relationship given a any problem of the content covered this week.